In past editions of Flashback Friday, I've touched on the early 90's grunge explosion that spawned so many great artists…some now legendary (Soundgarden, Alice in Chains, et al.) and others just a faded memory. Well this week, I'd like to shed a little light on one of those bands…one that falls squarely into the latter category. This San Francisco quartet had all the right elements in place to succeed and even got a little taste of the big time before they succumbed to the exhaustion and frustration that so often accompanies life in the music industry. In 1991, the influence of the Seattle music scene, which had seemingly overnight become an alt-rock mecca, was spreading at an exponential rate. So it's no surprise that about 800 miles south down the I-5, there were four guys churning out songs with a dark and brooding sound, chock full of riffs and venomous lyrics that shook a fist at real life issues like the glorification of violence by the news media ("Magnet"), religion ("Past the Point of God") and the illusion of the American dream ("American Flush"). This band originally went by the name Difference Engine and consisted of vocalist/guitarist Matt Hilzendrager, drummer Brendan Hagin, bassist Rich Carr and guitarist Jeff Clinton. Tireless touring up and down the west coast with other "up and coming" bands of the day (Fear Factory, Deftones and Sugartooth among them), generated considerable record industry buzz around Difference Engine. 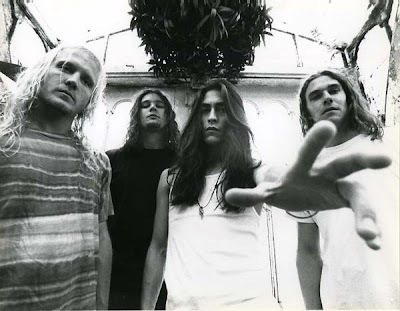 And in 1994, after being courted by multiple labels, the band cut a deal with indie label Pavement Music (Crowbar) who would release their debut album Reach that same year. However, around the same time, they were informed that the name Difference Engine was already being used by an established "electronica" band, forcing the name change to New Idol Son. The band, and their album Reach, would go on to receive critical acclaim from the music press, perhaps the most impressive of which, being named "Best New Hard Rock Act" of 1994 by European rag KERRANG!. But unfortunately, the manic touring schedule and hectic nature of the music biz was already beginning to take its toll. Jeff Clinton left New Idol Son just before the album's release, to be replaced briefly by Mike Davis, who would himself quit shortly thereafter. Longtime friend Jimmy Arceneaux would eventually step in to fill the role as the band began to gear up for album number two. In 1996, the band entered the studio to record their followup to Reach, which they had dubbed Peppermint E.P. However, due to matters well out of their hands, specifically a merger of BMG Music (who owned Pavement Music) with Arista Records, New Idol Son was inexplicably dropped by the label. In the aftermath, the band broke up and their much anticipated sophomore record was never officially released. Thankfully, through the wonders of technology (i.e. the internet), some of these tracks can be heard on the band's My Space page (along with the song "Butterfly" from their debut album). Go ahead…give them a listen and hear for yourself another band whose career was tragically cut short by the corporate powers-that-be, but whose music is not forgotten. I ran sound for these guys as they were coming up, and still have a cassette demo around(sans vocals) somewhere. I remember the first time I heard Mats' vocals, I was blown away. My fav song "Personal Texas" never made it to the album, but I still remember the lyric "smells like treated asphalt, baby, a black snake as far as the eye can see..." freakin heavy!! This business does chew'em up and spit them out, it is the worlds loss that these guys got left on the plate. Great comment...I completely agree! It's so frustrating to see great bands like New Idol Son fall apart due to lack of support from their own label. Like Reg said, most of the guys are still involved with music, just playing in different bands now, so hopefully we can feature some of those projects in the future.